Jewell Morgan knows what hard work is after having been a Registered Nurse for 49 years. She retired from work in 2007 only to become her husband’s full time caretaker after he suffered a heart attack in 2008. She became very sedentary due to back pain and then her eating increased. 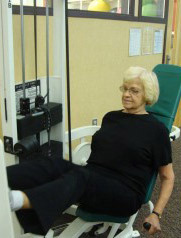 Her husband and her doctor both encouraged her to exercise and lose weight in order to avoid back surgery. In February 2011, Jewell got serious about her goal of losing weight. She began with regular water exercise, increased her fruit and vegetable intake, watched her portion sizes, and drank 6-8 glasses of water a day. She started working with her Personal Trainer, Amee Liles to start a strength training routine and to increase her cardiovascular exercises. Jewell’s life was greatly altered after her husband passed away in May 2011. She decided to join Amee’s “Stride to Lose Weight” walking program, in which she trained and completed the Susan G. Komen 5K. She also walked another 5K a few weeks later and then went on to finish 5th overall in Milestone’s Club Wide Fall into Fitness: Pedometer Challenge last fall! After going on a Milestone day-trip to Brown County last fall, Milestone members have become her extended family and her support system in which she can rely on to help her continue achieving her wellness goals. Working with her Personal Trainer and participating in the Fitness Challenges helps her to stay accountable to her exercise. As a result, her back pain is gone, her lab work and blood pressure are back to normal and she has reached her weight loss goal!